Columbus Lewis, an Oakland native, graduated from McClymonds High School as a four year athlete in track and football, where he was a member of the two-time state champion squad. Columbus will attend Cal State Long Beach; his decision to attend college is based on his desire "to come back and create a positive atmosphere for my family and my community, to become a better role model for my brothers and younger family members, and to build a solid foundation for my career, where I'm able to financially support my family and give jobs to people in my community." Ezekial Duncan hails from a long line of singers and artists, "so me getting on the stage was inevitable." During his years at at R.J. Reynolds High School, Zeke served as 2017-18 student body president, Tri-M Music Honors Society President, co-director of the "infamous" all male acappella group “The Acafellas”, as well as a participating in the National Honors Society, Black Achievers, and the Drama Club. He has always been interested in "singing, acting, dancing, learning, and meeting new people!" Zeke will major in Music Education at Wingate University and hopes to become a high school chorus teacher, eventually moving on to teach at a college or university. 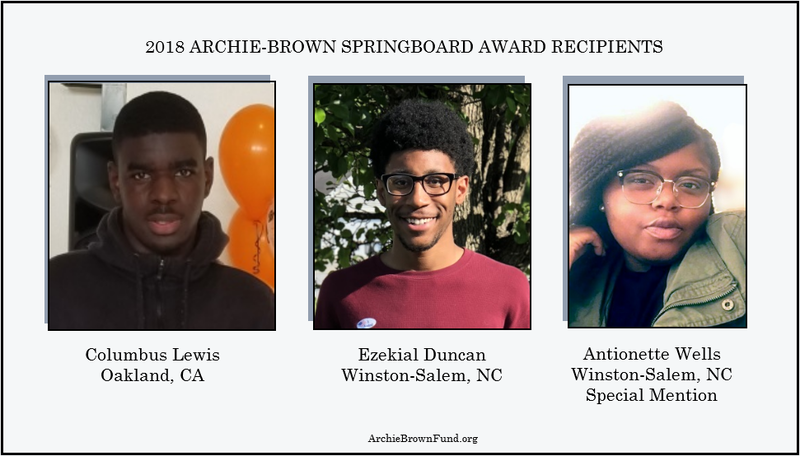 In 2018, the Archie-Brown Fund made a special award to Antionette Wells in loving memory of our family matriarch, Mrs. Ella Ruth Archie (1922-2017). Antionette is a graduate of R.J. Reynolds High School; she will begin cosmetology school in the fall and with the vision of opening her own salon. Antionette received the Springboard Award in recognition of her outstanding character and service to Galilee Missionary Baptist Church, where Mrs. Archie was a long time member. Ummi and Jabreel Green are Berkeley-based brothers who, among other interests, are teaching themselves software development (coding) and are avid epee fencers. “In between our studies and practicing fencing, we sell See’s candy bars to try to raise funds so we can compete in tournaments. We truly appreciate all the people who stop and support us.” They used their Award to purchase equipment and to compete in the USA Fencing National Championships in Salt Lake City, Utah. Devonte Morris attended California State University, Northridge and Berkeley City College. He is an Oakland native, and since he was 13 years old he has been heavily involved in the East Oakland Youth Development Center, where he recently served as the Assistant Director of the Summer Cultural Enrichment Academy. Devonte is a budding shoe entrepreneur, and used his Award to build his sneaker customization skills. An impressive spoken word artist, Elijah Pone writes “to change and help lives.” He is a 2016 graduate of Reynolds High School and was an active member of Authoring Action, a youth development organization that develops authors and social justice advocates. Isaiah Martin is interested in business administration and computer science. He successfully completed a three year stint in the inaugural cohort of the Hidden Genius Project, which builds software development and entrepreneurship skills of African American high school-aged young men. Isaiah used his Springboard Award to attend the Yale Young Global Scholars Technology, Innovation, and Entrepreneurship program. Akande X (Kameron McDowell) is a 2015 graduate of Oakland School of the Arts. He is the author of several poetry collections, including Havana, released in June 2015. 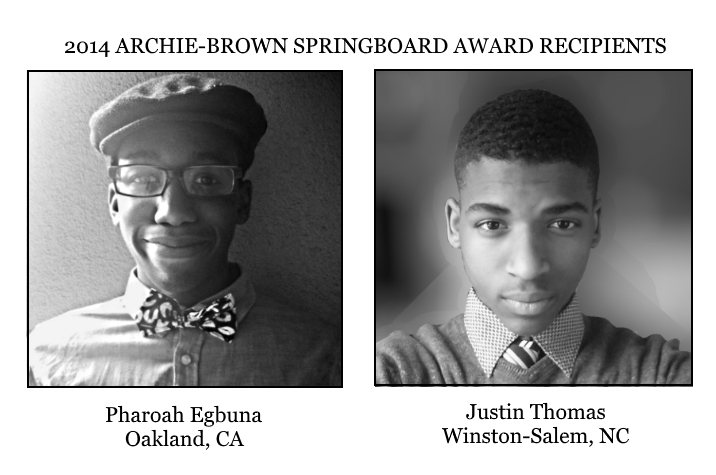 He used his Springboard Award to support a five week cultural research trip to Harlem. Chace Washington-Saunders is a 2015 graduate of Reagan High School. He was a top-ranked 400 meter sprinter, finishing second in the 2015 NC state championships. Chace used his Springboard Award to continue his academic and athletic pursuits at Hampton University. Pharoah Egbuna, then a high school sophomore, was already an accomplished photographer and used his Springboard Award to sharpen his technical skills through courses at the San Francisco Art Institute. Justin Thomas was a high school junior and a member of his school’s varsity tennis team when he received the Springboard Award, which he used to strengthen his game by attending the Nike Tennis Camp at Duke University.